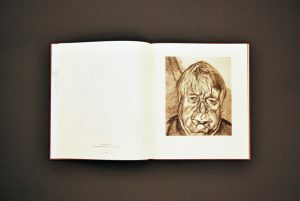 Lucian Freud was born in Berlin in 1922, a grandson of Sigmund Freud. He moved with his family to England in 1933 where he became a British citizen in 1939. Freud studied briefly at the Central School of Art in London, at Cedric Morris’ East Anglian School of Painting & Drawing in Dedham and at Goldsmiths College University of London from 1942 – 1943. Freud is one of the formost figurative artists working today, he lives and works in London. Retrospective exhibition: Hirshhorn Museum and Sculpture Garden, Washington DC, travelling to Paris, London and Berlin. 1989 shortlisted for the Turner Prize.